Have some family fun this Holiday by starting your own traditions! Of course, baking cookies is one way to have fun! 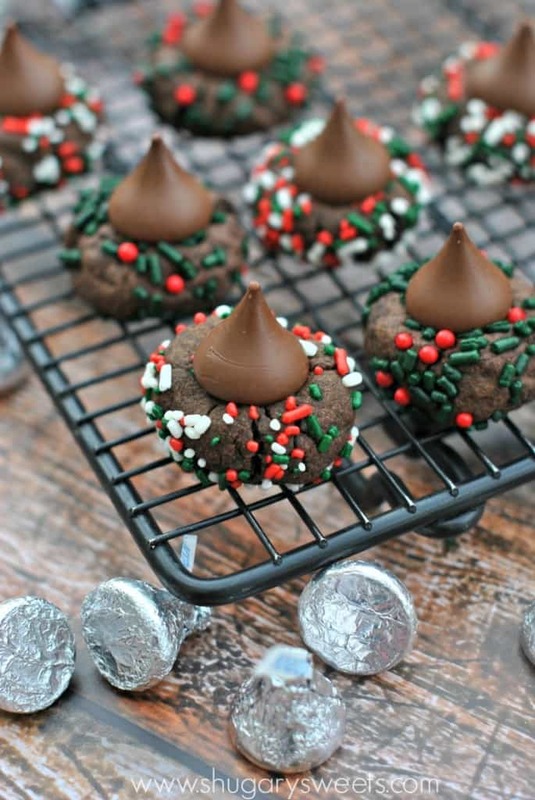 These Chocolate Kiss Sprinkle Cookies are a great way to get everyone in the kitchen! So recently, I asked on facebook, what is your favorite holiday cookie. WOW. I had so many responses! And there was an overwhelming answer: Peanut Butter Blossoms. 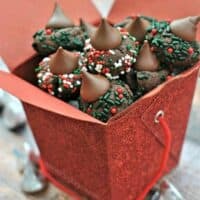 If you’re not sure what peanut butter blossoms are, they are peanut butter cookies with a Hershey’s Kisses Chocolate pressed into the center. YUM. But before we get to today’s recipe, let’s talk family fun. Specifically, HOLIDAY fun. What kinds of things does YOUR family do this time of year to create lasting memories? Do you start your own traditions or do you repeat those favorite activities from childhood? I know this sounds totally cliche, but we LOVE watching holiday movies. And of course, we LOVE baking and eating cookies. Every year we make a big batch of sugar cookies. Complete with frosting and lots of sprinkles. If you’ve ever had kids decorating cookies in your kitchen, you understand the headache of sprinkles and frosting everywhere. No matter how much parchment paper I lay out, there is inevitably a jar of sprinkles that “accidentally” spills, there are dabs of frosting on the seat cushions, and of course I find cinnamon red hots on the floor for weeks! But, while it may be frustrating to clean up after this activity, I know one day I’ll be sad when there’s no one at home to decorate cookies. Well, I guess my hubs and I can do it together, but it definitely won’t be the same. Although, I’m sure he would dump a jar of sprinkles just to make me feel better. So today’s cookie needed sprinkles. LOTS of them! However, they didn’t make a big mess. After you make your dough, roll it up into balls. Roll each ball into sprinkles (that you poured into a shallow bowl). Bake them up and press the kiss into the center immediately after removing from the oven. And enjoy. While watching movies. Or decorating your Christmas tree. Or whatever holiday tradition YOU enjoy! Today I’ve also joined up with some of my friends to share some Reese’s and Hershey’s holiday treats. 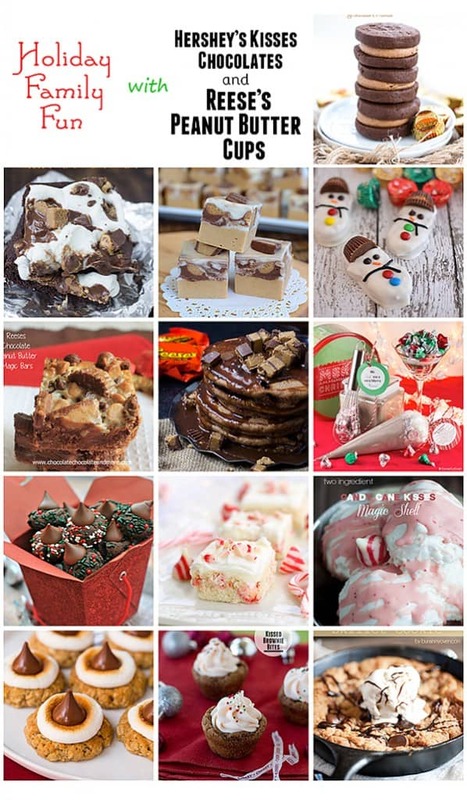 At the end of today’s post, check out some of these delicious recipes for your holiday baking! In a large mixing bowl, beat butter and granulated sugar together. Beat in eggs, one at a time. Add flour, cocoa powder and peppermint. Mix until fully combined. Pour sprinkles into a shallow bowl. Scoop dough into a ball (large tablespoon amount) and roll in hands. Roll in sprinkles, pressing them onto cookie gently. Place cookie onto a parchment paper lined baking sheet. Bake in a 365 degree oven for about 10 minutes. 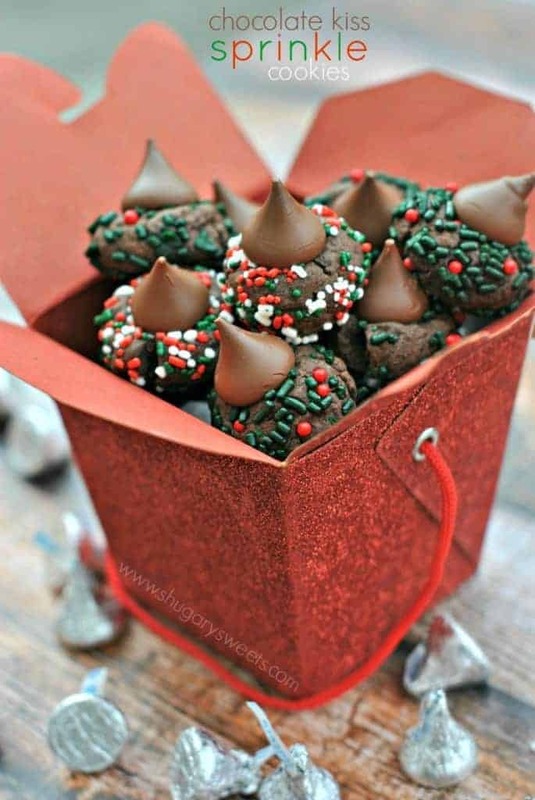 Remove from oven and immediately press with an unwrapped Hershey's Kisses Chocolate candy. Cool on wire rack. Store cookies in an airtight container for up to one week. ENJOY. Depending on temperature of kitchen, you may want to chill dough about 30 minutes prior to rolling into balls. Love those pretty sprinkles — and that glitter box. NEED!! These are so pretty! Anything with Hershey’s Kisses are always a good idea….and an extra good idea when you load ’em up with sprinkles. Love these! Anything that involves Hershey Kisses, I’m in. For sure! They look perfect. Pinned. These look delicious! I love how colorful they are! For my family, I have incorporated some things that we did when I was little, but also have started some of our own traditions. It’s so fun to have young kids at Christmas! The excitement is so fun to watch! Beautiful cookies! These are my husband’s favorite! The holidays are not complete without some form of a kiss cookie! My kids always have fun making them. Sprinkles and kisses… Sign me up! These are just so pretty and I love how you packaged them. Sprinkles and Kisses…two needed things for Christmas cookies. We always bake with the kids too…eeeiikk to the mess, but definitely fun memories. I love that you made these “blossoms” extra chocolatey (and festive with sprinkless)!! Peanut butter blossoms are always on cookie platters … there is a reason! The sprinkles, the kisses, it all makes this cookie so pretty! These cookies are so cute and festive! I love them. Super cute! I’m making my Christmas cookies this week. I can’t wait..Maybe I’ll add these to the bunch. I love sprinkles! These cookies look so gorgeous and festive – I’d be eating them all day long! LOVE the sprinkles on these, and I love the packaging! These are just holiday perfection! My favorite Christmas pastime is driving around and looking at Christmas lights”! My parents used to take my brother and I to a nearby neighborhood that had the entire street decorated in lights! It was great! These cookies are pretty great too. I love cookie a with the kisses on top. And thee are just perfect for Christmas. Thanks for sharing, Aimee. 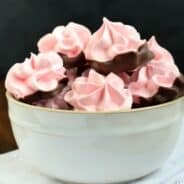 The chocolate kiss sprinkle cookies came out very dry – what might I have done wrong? There are no eggs in this recipe so I wondered if something else is not quite right. Thank you. Looked yummy. Could taste them in my mind! However batter not thick enough to roll… Spread out when baked … Tasty but chewy. What went wrong! Also only made two dozen! 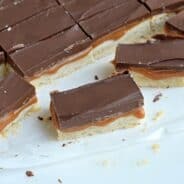 Pingback: 10 Kiss Cookies Recipe To Try At Home! In the process of making these cookies, they are sooooo gooey. You can’t even roll them Ina ball. I did everything this recipe said to do and it’s for some reason not right. I think the recipe owner needs to go back and try again! The recipe calls for refrigerating the dough if it’s too soft. Have you tried this? I made these for a cookie exchange this weekend. Had I done a test run, I would not have picked these for the exchange as I had to make 18 doz. That being said..when all was said and done they turned out great. The cookie remains chewy, and all who tasted them like them. The reason I would not have chosen them is because they were difficult to roll…dough was very soft….frosting consistency. I had to keep the dough in the refrigerator in 2 separate containers so I could roll 1 dozen, put that dough back in the refrigerator and take out the next container, which did help, but still very messy. I will definitely keep them in my cookie list, just won’t commit to 18 dozen again…lol. Thank you for sharing your recipe. BTW…one last comment,….I made a batch using cold butter and didn’t level off the cup of flour to see if it would help the consistency. Not by much, but it did not affect the taste or the texture of the baked cookie. Thanks again. I added a 1/2 cup of flour and chilled the dough for an hour so it was easier to handle. The cookies turned out great! Can you use hersheys regular unsweetened cocoa powder or must it be dark chocolate?